Funeral services for Jerry Walker Merrell will be held in the chapel of Almon Funeral Home in Carrollton, GA on Saturday March 23 at 3:00 P.M.,Mr. Larry Johnson officiating. The family will receive friends from 1:00 to 3:00 P.M. prior to the service. Interment will follow in the Roopville Cemetery. Mr. Merrell was born on September 15, 1932 in Heard County, GA and died March 18, 2019 at his home in Acworth, GA.
Mr. Merrell was preceded in death by his parents, Glenn and Mildred Walker Merrell of Roopville, GA, his first wife, Marie Folds Merrell, and his son, Jesse Richard Merrell. Survivors include his wife, Vera Merrell, his daughter, Janet Lisa Merrell (Alan Paduano), two stepdaughters, Carla Briley (John) and Leisa Cash (Paul), his sister, Virginia Merrell Kirkpatrick, and several nieces and nephews. 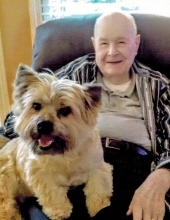 He is also survived by his dedicated caregiver, David Cotton. Mr. Merrell graduated from Roopville High School, attended Berry College, and graduated from Georgia Tech with a degree in Mechanical Engineering. He was a long-time resident of Spartanburg, S.C. where he was the assistant manager of Hayne Shop for Southern Railway until his retirement in 1987. After his retirement he became interested in genealogy and had over 130,000 people in his “Tree” as of this year. Mr. Merrell was a lifelong member of Roopville Baptist Church. In lieu of flowers, donations may be made to Roopville Baptist Church, 18 Old Franklin St., Roopville, GA. 30170. Messages of condolences may be expressed to the family online at www.almonfuneralholong me.com. "Email Address" would like to share the life celebration of Jerry Walker Merrell. Click on the "link" to go to share a favorite memory or leave a condolence message for the family.